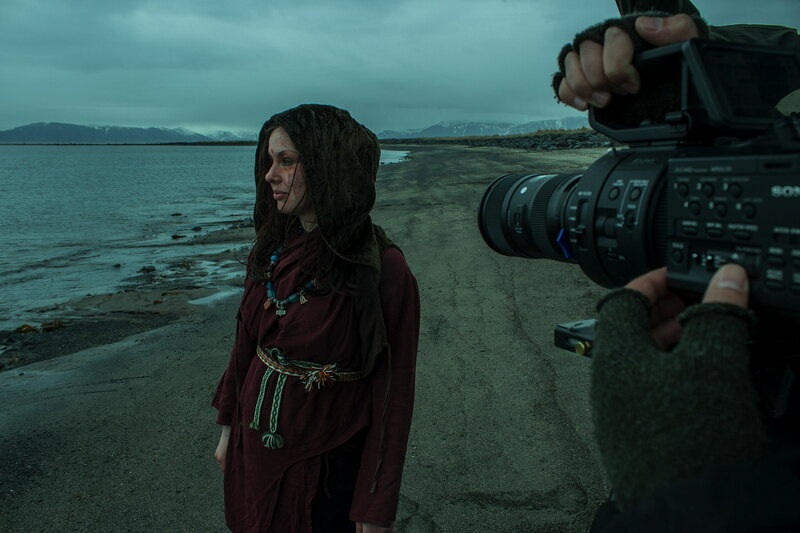 Rising from the ashes of a lacklustre reaction to his end of year student film project, director Gísli þór Gíslason set his sights on the Viking folklore from his native Iceland and put together a crew from his German film school for mythical short Nykur; a film which serves as both his graduation film and a music video for Icelandic band Arctic Roots. Gíslason takes us through the cross border journey he and his crew embarked on to complete the film. As I was starting the 5th semester of my studies in Film & TV in Darmstadt, Germany I found myself at crossroads. My 4th semester short movie project was received poorly at the local student film festival on campus. During the semester break my girlfriend had just come from a study trip in Norway in Nordic co-operation in theatre performance and mentioned the water beasts called Nyx or in Icelandic Nykur which also appeared in Wagner’s Niebelungslied Rheingold maidens. It gave me the idea of a man from the high point in the Viking culture and mythology encountering a mythical creature like that. I was later approached by my girlfriend about making a music video for her band Arctic Roots, for their new song titled Nykur and completing my own graduation project at the same time therefore killing two birds with one stone. I immediately started penning a story and putting together a pitch for my project professors. What I wanted to do was incorporate two cultural worlds (German and Icelandic) reflecting on the chapter of my life I was about to close upon graduation. My girlfriend was a great help going over the treatment with me, pointing out errors or mismatches. Once the pitch and location photos, along with character ideas were approved by my professors I contacted my friend and schoolmate Marco Schott to come on board as DOP. He said yes even before reading the script! I think the idea for him of shooting a project on an international level was very appealing and presented a challenge that he’d wanted to tackle for a very long time. A challenge which he managed to successfully complete. My other colleague, Luis Jacobi asked to join the group as a camera assistant and later served as a co-producer and co-editor, roles in which his input provided important and significant contributions to the project. Another colleague of ours asked to join the production later, so he filled the director’s assistant role and provided some organisational assistance to the project. So in total there were three Germans and one Icelander travelling from our university in Germany to do a music video in Iceland – We originally intended to set out and conquer the world but one has to start somewhere! During pre-production I was presented with the problem that the script with its heavy use of flashbacks proved to be a bit to complex for the viewer. Those flashbacks explained the origin of the feud to which the main character would be waking up from and involved a wife, a best friend’s betrayal and a happy supernatural Hollywood ending. In hindsight it was a good creative decision to cut those elements out of the script in favour of a more linear story and the team members involved that suggested it were absolutely right. Those elements were simply too big to fit into our 5 minute video. That were the first lesson I learned in making this music video. When the time came at the end of March / beginning of April, we began filming the project which took around 8 whole shooting days of the 14 days the German schoolmates stayed at our apartment while we stayed at my girlfriend’s mother’s. My main scouting area was around 20-30mins driving range of the ReykjavÌk metropolitan area. I had especially chosen locations mindful to not make another ‘postcard video’ from places that people knew were Icelandic, instead choosing well hidden locations. For the production camera we chose the Sony NEX FS700 that Marco had acquired at his company. Due to its amazing Super 35MM sensor and other unique video features, it gave us the elbow room we required to make this project in the low light conditions of the cave of the Völva, which was merely lit with a LED panel and the torches in the cave; the camera sensor took care of the rest. We decided for financial reasons to shoot in 8 bit video instead of 12 bit raw video – the recorder and the data storage and back ups would have been phenomenal in comparison to the 8 bit workflow price. The 2TB hard drive I got was enough even for the ProRes files alongside the raw 8 bit files. We used Khalid Mohtaseb and his collaboration with Salomon Lighthelm as our main inspiration for the visual style of the video. We got a wonderful cast from the ReykjavÌk metropolitan area through a mix of Facebook and friends. They were amazing actors, very professional and most generous with their time. The Valkyrie actress was classically trained in London and does a lot of theatre work with the Nordic Spindrift Theatre. The Viking guys came from the Viking re-enactment group called Rimmugýgur and had been working as extras on HBO’s Game of Thrones series and other international projects. Everybody worked really hard and the results were really good. When we watched the dailies we were stunned by the quality of work we were all able to contribute to the project. People have been very positive about the film and it has been well received by viewers on YouTube and Vimeo but we want to share it further so more people can see and experience it with their own eyes. The band Arctic Roots have great tracks available on their SoundCloud page so feel free to check them out as well, without their help and the hard work of the crew this video would not have been as good as it turned out to be.